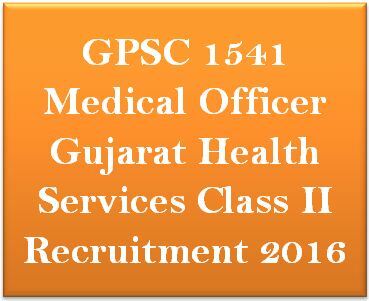 ojas.gujarat.gov.in GPSC 1541 Medical Officer Recruitment 2016 GPSC Medical Officer Gujarat Health Services Class II Recruitment 2016 ( 1541 Medical officer ) Apply online. Gujarat Public Service Commission(GPSC) issued recruitment notification 2016 invites online application for 1541 Medical officer posts. Eligible candidates can apply online through main website ojas.gujarat.gov.in on or before 16 May, 2016. Other details like post name, educational qualification, age limit, selection process and how to apply are given below. Gujarat Public Service Commission (GPSC) has recently released notification for Recruitment of 1541 Medical Officer Gujarat Health Services Class II Posts. The last date for GPSC 1263 Medical Officer Posts Recruitment 2015 is 16/05/2016 13:00:00. Eligible and interested candidate need to apply online on GPSC official online website before last date. Further details related to ojas.gujarat.gov.in GPSC 1541 Medical Officer Recruitment 2016 given below. (1)Possess a degree of Bachelor of Medicine and Bachelor of Surgery of any of the recognized University/ institution or deemed University or possess any other qualifications specified in first or second schedule to the Indian Medical Council Act. 1956. (2) Possess the basic knowledge of computer application as prescribed in the Gujarat Civil Services classification and Recruitment (General) Rules.1967 as amended from time to time. Age Limit : Not more than 35 years. Relaxation as per rules.